Ibrahim Bellendia used to be a member of the clandestine Nuba organisation - Komolo - that opposed the Government of Sudan since the beginning of the early seventies. Yet, when Yousif Kuwa and many other Komolo members decided to join the SPLA, Ibrahim Bellendia decided to go his own way. He joined the National Congress Party, and became speaker of the South Kordofan State Assembly. My name is Ibrahim Mohamed Bellendia. I come from Kadugli, my age is 48 years. I am the Chairman of the Assembly of South Kordofan State and I am considered as one of the people who established the Komolo organisation, which operated as a secret body in the Nuba Mountains since 1972. At that time, the northern political parties, mainly the Umma Party and the Democratic Unionist Party (DUP), were dominating the life in the Sudan. They ruled and controlled all the life. Our grandfathers followed those parties without forming their own opinion, without ever refusing anything. They walked behind the politicians, whatever they were planning, whatever they were doing. The reason was that after independence, we, from the Nuba Mountains, we came late to the education. We came late to the big cities, late to be citizens. All the people were kept there in the Nuba Mountains for a long time. And only some people, some youth, escaped. They came to the North, they worked hard and some of them tried to study. But the majority of the Nuba youth didn't leave school before the end of the sixties, the beginning of the seventies. So the beginning of the seventies is the starting point for a Nuba identity. We as youth from the Nuba Mountains, we wanted to be independent. We wanted to rule ourselves, and to be classified as a nation. This was our opinion, so we decided to make a body that would identify our dignity, our nation, our place, our location in Sudan. We were youth, we had the sense of youth, and we started blindly, hoping to achieve something. And we achieved many things, working with whatever was available. By the end of the seventies, we elected our own Nuba members to the institutions. Daniel Kodi was elected to the National Assembly and Yousif Kuwa Mekki was elected as member of the Regional Assembly and I myself, I have been in the local council for Kadugli constituency. You can say a war broke out between us, the Nuba youth, and the other parties, the Umma, the DUP. When we came, the people in the North immediately made a very harsh plan to destroy our organisation. We, as politicians, suffered a lot in those years. Exactly in the middle of the eighties, the two parties - Umma Party and DUP - planned the violence; they planned to destroy, to crush the organisation. They armed the Arabs in the Nuba Mountains, and they divided the people tribally. The Government arrested most of our people and they treated them badly, humiliating us and others. We saw no other solution than to start looking for a way to arm ourselves. Then Yousif Kuwa left Kadugli together with some others from the Komolo youth and he joined the Sudan People's Liberation Army (SPLA). We only joined the SPLA searching for a place where we can arm ourselves to defend our nation. However, within the concept of the SPLA, Yousif Kuwa and his colleagues who had joined, had no other choice than to be part of the SPLA. And so the SPLA was developing in the Nuba Mountains. It began to recruit many people to follow those who had already joined, to have a strong body of Nuba in the SPLA. At the beginning of the nineties, the Nuba Mountains youth became the backbone of the SPLA. They were fighting at all the fronts, either in the Nuba Mountains itself, or in the eastern Blue Nile, or any other place where the SPLA was active. Our people, our youth, have been very strong because our culture makes us very fit to be soldiers. All the commands of soldiership, and the system of soldiership, it is easy to us. It is known from the time of our grandfathers, of our ancestors. Our ancestors joined the fronts of the Italian War in Ethiopia, they joined in the Middle East there, and they joined in the troubles in Libya. For this the Nuba people are known to be capable for soldiery activities. Did you also join the SPLA? Almost all my colleagues passed away. All the people who are leading the SPLA now are not from the first generation. The first generation went out. And this shook the SPLA to some extend. You know, the English have a saying: "it's the brilliant that start the war, but it's the fools that complete it". And I believe this is true. The first decision to go to war is very complicated and hard for anyone to take. Most of my generation passed away; this makes me very sad. It's the life... it's the life; one day I am going to pass like them. But we are going to keep their memories; as long as we are alive, we will carry on their conceptions and pass them to our coming generation, so they can complete what we were thinking about. But apart from your dislike of violence: what were your reasons not to join? By now most of the members of Komolo are no longer with the SPLA. We started this body for the Nuba Mountains, for the Nuba people. There were reasons that forced us to join the SPLA, but it was not our target. The Government had been supporting the other tribes, we had no support inside, so we explored any possibility to protect our people, or our nation. Our target was to force others to be aware of us; this is what we were thinking at that time. And we are very happy, because we succeeded. 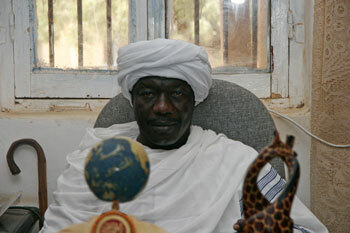 By now the Nuba are known all over the world as a tribe, as a location, as a party in the Sudan. The Komolo members who joined the SPLA, most of them have passed. And the youth who grew up under the SPLA - the SPLA has more than 20 years now - the youth is not carrying out the [original] concepts of the SPLA. The targets of the SPLA are not in their mind. So they do many things in ways we do not exactly like. This has made most of the Komolo chose to be inside [the political process, rather then to go 'to the forest']. There is another reason that Komolo are not joining the SPLA. Most of the Komolo were waiting to see what the SPLA would do. We knew that the people who have been in the military, they have a mentality that is completely different from the political way. So we were waiting for the SPLA to come inside and to start a discussion to settle this and many other things, to settle how to rule. When the SPLA came, they drew a line; they said that anyone who didn't join the SPLA in the forest, carrying the gun, will not take a position [for the SPLM]. All the people who come from the forest they have the mentality of the military. They have no vision of how to rule the country. This made most of the Komolo decide not to join the SPLA; the leaders of the SPLA drew a line. They even deny the contribution and the role of the Komolo inside. By now we are gazing, we are looking at them to see what they are going to do. And they themselves are wondering now what to do. If you come from Europe or from America and if I take you any city here, and I let you there: can you know what to do? Can you know how to deal with the people, can you know what the people are like, can you know the rules, and can you know how the people are living? You can't. So now the people [of SPLM/A] have had about 20 years outside in the forest. How should they deal with the people here, who have been ruling for about seventy years, who have money, who have good planning, who have a vision of how to rule the country? By now the SPLM needs people inside who know how to deal with people like those. But when our brothers in the SPLA came, they denied this - and so by now we are away. We don't want to create new bad feelings, problems with our brothers, so we keep to the side. We say that the field of the Nuba Mountains is very wide: everyone can come and everyone can contribute; everyone can have a role in the development, in progress, in interweaving the social structures. This is my vision. I think we have to find a way soon to sit with the SPLA. Because if the SPLA fails, it is our failure. We are supporting the SPLA somewhere, even though we are against them. I'm not against the SPLA because of their program; I'm against the way people are treated in the SPLA. Unavoidably, if I say I want to have a role [in the SPLM], problems will arise somewhere. So I let them go their way and I will go another. In the end all the ways will take us to the Nuba Mountains. So the main reason you joined the NCP rather then the SPLM, is the differences in experience, in resources, organisation and mentality between the NCP and the SPLM? You know, the [SPLM] members of the State Assembly have been given the international standard of parliamentary procedures by professionals from Namibia and other countries. They now are confused. They want to apply these concepts at the level of the State Parliament - and that is not the way it works in Sudan. But I have a plan to make a course for the members of the State Assembly so they will know the right procedures; that is my responsibility. The two parties are very keen on their [own] concepts and the SPLM and the other parties have completely different scopes. How do you see the future of the Nuba Mountains? According to the CPA, South Kordofan is considered one of the Northern States. There is also an article in the CPA that says that after six years the people of the Nuba Mountains will vote, as they like, to where they want to belong. But the reality is that we have not less than two million people in the cities of the North. Khartoum, Medani, Port Sudan - all. And look at the boundaries: whether we are part of the North, or whether we are part of the South - in both cases we are going to be in the boundaries, and we will continue to suffer because of this. So our option is the unity of Sudan. The CPA acknowledges that yes, there are some people who joined or supported the SPLA and they hope they will be part of the South. But not less than 80% [of the Nuba] are Muslims. So if we are right next to the boundary, if South Kordofan begins where the North ends, we are going to suffer because of the religion. Let 's say 90% of the people in the South are Christian and 90% of the people in the North are Muslim - I don't know exactly - but according to me it will be part of the problems. Second: we have to consider the Nomads. They go according to the mood of their animals. In autumn, the animals always come to the North and the nomads follow their cows to where the grass is. So when Sudan would become two countries, the nomads are going to suffer, because you can't cross the boundaries of the other country unless you have permission. Even if you have permission, maybe you are going to pay a high taxation for the passing of other boundaries of the country. This is what I'm thinking about when I look at the future. So the unity of Sudan is our target: we are going to fight for the unity of Sudan.